Quick! Think of your top five favorite things: if bluegrass, dancing, beaches, moonlight, and adorable fiddle players aren’t on that list, then we probably aren’t friends, and you’re probably on the wrong website. If they were on the list, then the bluegrass get-down falling coincidentally on the rare “Supermoon” last Saturday night was heaven on earth. 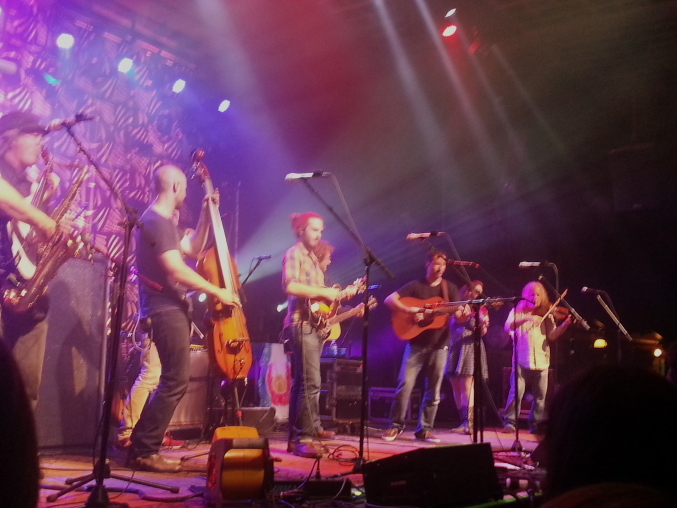 On Saturday, July 12th, 2014 Railroad Earth and Yonder Mountain String Band with Allie Kral rocked the final night of their nearly three week tour in Hampton Beach, New Hampshire. The Hampton Beach Casino Ballroom is a historic site whose rustic wooden beams and floorboards have vibrated with the chords of such legends as Led Zepplin, B.B. King, Janis Joplin, and Phish. Through the open doors, one could see beyond the boardwalk to the ocean waves and the epic Supermoon glowing luminously above it all.